Use regular gas, unless the car manufacturer tells you otherwise. Be sure the pump displays the correct grade and price per gallon. Check to see that the total price display starts at $0.00 and doesn’t “creep” up a few cents before squeezing the nozzle. Most stations now charge different prices for cash and credit. Pay cash and use self serve whenever you can. You will see a savings. Take advantage of gas sale days, when prices may be as much as 5 cents cheaper for certain grades. Accelerate gradually and drive smoothly and you could see as much as a 20 percent gain in fuel economy compared with what you'd get with an aggressive driving style, according to the Environmental Protection Agency. Skip those jackrabbit starts and sudden pedal-to-the-metal maneuvers. Keep your vehicle well maintained to keep it operating at peak efficiency. An inefficient engine won't make optimum use of fuel. Clean out that trunk and back cargo area. Extra weight decreases gas mileage. Keep tires properly inflated. Under-inflated tires will reduce your gas mileage. Don't idle your car for too long. Don't waste fuel by sitting in that drive-thru lane at a fast food restaurant. Park and go inside instead. Don't let your vehicle idle as you wait outside the elementary school to pick up your children. Idling uses more fuel than turning the engine off, waiting for your youngsters and then restarting the engine. When you're in slow city traffic, keep the air conditioner off, if possible. That air conditioner is a burden that uses fuel. Combine your errands into one trip, rather than taking multiple trips from home. Plan your trips so you go out during less-congested times of day. When there's less traffic, you're more apt to be able to drive smoothly. Look at alternative transportation options - even if it's just for one or two days a week. Walk, bicycle, carpool or take public transportation and leave your vehicle at home. When you shop for a new vehicle, compare fuel economy. Bear in mind how bigger vehicles, bigger engines, four-wheel drive and lots of optional equipment can add to a vehicle's weight and, as a result, reduce its fuel efficiency. 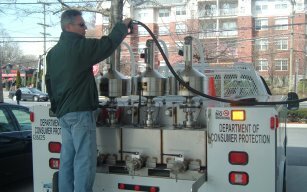 The Department of Consumer Protection regularly checks the accuracy of gas pumps, gas price signs and gasoline quality. Contact us for more information or if you have a complaint about a gasoline purchase. The department can be reached at or at (914) 995-2155.